Many people were interested in making some extra money online by doing any kind of online jobs from their home. A report says, there are about 2.45 billion searches on Google every day related to online jobs. On the other side, you will get more than 5 Million results in front of your computer. Out of them, I will teach you to start a successful blog and guide you how to make money from it? In my beginning days in this Internet field, I saw tons of websites out there explaining the same topic but in the end, you will get nothing. There are few sites that will take you until the end. Out of all online jobs available there, blogging is the most successful online business that will bring you passive income over a long time. Remember, if money does not come to you when you are unavailable at your work, then you should be working a whole day a year. 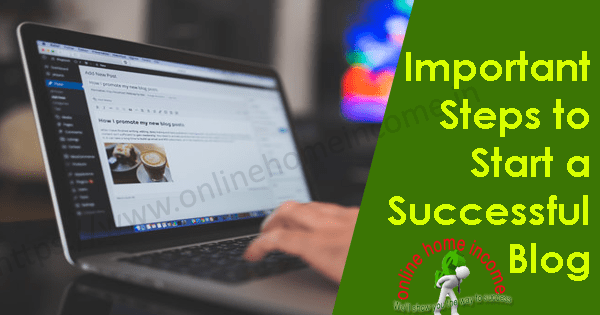 Many successful people on the internet have learned the art of blogging and so that they are leading a family oriented lifestyle the whole day. Starting a successful blog does not happen overnight. When you search the net you can find thousands of articles that will teach you how to start a blog? But no one talks about the hardest part of the blogging called as hard work and effort. Since no one was ready to talk about this part, many people often drop their blogging business after a while. So before starting this business, you should have these qualities mentioned below. Treat your blogging business as like other profession and set a goal either short term or long term. Without Goal, you can not find the path to travel. Rich people become rich because they know how to deal with money? Your short-term goal would be to register a keyword rich domain name. And a long-term goal would be to get 1000 unique visitors daily to your blog. Without your real interest, you cannot succeed in the goal. Every people have some hobbies in their everyday life and hobbies become their passion. Grab the passion and put into the work that will help you achieve your goal. As of now, it is financial independence is everyone’s dream. As I have already told you that you should have a Goal and a Passion for it. Alright, let’s ask will it give you success? Of course NO! You should compensate one thing for you to get other things done. Likewise, you should spend at least a few hours every day to work on your goal. The work I mean here is, Content Writing, SEO activities etc. Once you are ready with all these requirements, then there is no way blogging will bring you success. In the past articles, I have written about the blogging start-up steps to start a successful blog. To the people who want to recall, please read the information on starting a blogging – simple start-up guide. In this article lets see the next face of blogging, to be considered when starting a new blog. Before going through further, I would want to remind one thing, A successful blog is not built in a single day or a month. It is the result of long-term hard work and effort. In the next session, I will discuss the four important aspects when starting a blog. A perfect domain name will itself market for its own kind of the market. This is the first actionable step to start a successful blog or website. For an example, you can take the domain name: onlinehomeincome itself has value and it tells people the core purpose of this blog. You must be very careful while selecting a domain name because it is your online identity to the world. There are some principles to be followed in selecting a Good Domain Name such as a domain should consist of your niche keyword for a better ranking. Your domain name serves many purposes such as your brand, product, or services offered to the audiences. This article from an Indian based blogger has swept my mind because she nicely covered the topic Choosing the right niche for the blog. I am sure this will surely interest you. There are a lot of ideas available to choose a perfect domain name for your blog you will get after you read the article. When speaking technically, you should pick a domain with your primary keyword like online home income, blogging tricks, blogger tricks tips etc. With primary keyword in your domain will give detailed info about your business to the audiences. Primary keyword in your domain name will also help your SEO activities very effectively. If you want to buy a domain name, you can make a free search on Godaddy, Bluehost etc. Normally, registering a domain name will not cost more than $15 per year. Take one example, Neil Patel blog, this blog kills every other blog in the blogging industry because they are already successful in that particular industry with their name and just want to market their name through blogging. BUY .COM DOMAIN at just Rs.769 Per Year. 1.) You should register a domain name based on your real interest and think in mind about its market value. 2.) Technically, include your keyword in the domain name to rank better and faster. 3.) You can register your domain name in your own name, only if you are a master in that field. When you completed purchasing your domain name, your next move is to purchase reliable hosting. Reliable hosting is the second step to start a successful blog in 2019. The meaning of reliable hosting: consistently good in quality or performance; able to be trusted. Your hosting should be reliable unless you are going to ruin yourself in your blogging career and your passion. Your website content and your database will be stored on a special computer called Web Servers and from there it will be served to the entire network in the world. As same as here, there are a lot of web hosting companies out there to choose from, but not all of them worth enough for your business. You should decide yourself before making the decision of purchasing the hosting from the right company. 1.) I recommend you choose any of the following companies for your blogging business: Bluehost, Hostgator and Godaddy. 2.) Web Hosting is like a human body, where it holds your entire blog content and database. From here, your blog will be served to the world. 3.) It should be fast enough to handle large visitors, reliable enough to serve on time with almost zero downtime. There are the major factors to consider in hosting. I personally offer the best hosting plans to startup individuals based on their requirement. The starting plan starts at $20 with Free WordPress Setup. You might notice the word “choose” was written many times because it has some value. Blogging is full of options and choices in making, planning and deciding before execution. Choose the blogging platform wisely as it is the virtual face that you show to the world. Blogging platforms were broadly classified into two important sections: Free and self-hosted. 1.) Word Press – lifetime free hosting with subdomain “yoursitename.wordpress.com”. 2.) Blogger – Lifetime free hosting with subdomain “yoursitename.blogger.com”. 3.) Weebly – lifetime free hosting with subdomain “yoursitename.weebly.com”. and lots more like Wix, Joomla, Tumblr, Ghost etc. Self-hosted platforms mean that you host your blog (or) website on your own server you purchased. It is the best way to start a successful blog because free blogging platforms are limited to resources and doesn’t have enough customizations. Godaddy, Bluehost, Hostgator are the industries major domain hosting solution providers in the world. If you wish to start your blog on a self-hosted platform you can get started from here. You need to pay some fee to register a custom domain name and a hosting space for your blog to stay live over the internet. Normally it won’t eat much of your capital investment. Note: If you plan for a long-term business, then you should go with self-hosted platforms because of the following reasons. Why do I not recommend free blogging platforms? i.) Free blogging platforms are easy to set up and manage but with more limitations. ii.) Limited features and customization options. iii.) You can not run any monetization methods or advertising reliably. iv.) They may suspend your blog anytime with or without prior notice. This is the worst thing I faced when I start my own blog in 2012 with blogger. On one fine day morning, I entered my blog URL on to the browser and saw my blog was not found. v.) The blog name is not owned by you as long as you purchase the custom domain name. vi.) The platform providers will advertise on your blog to generate revenue for their sake. It is the biggest un-satisfied thing in free blogging. So, wrapping up everything I just want to say if you want a passive income through online jobs, start a successful blog on your own hosting platform. 1.) All you need is to buy a hosting space and register a domain name. 2.) You are the only owner of the blog and you can have the complete rights to add, edit, modify, delete any information and content on the blog. 3.) No limitations and free to use all features on your blog. Creating the Best Layout for your blog is considered the most important step in your blogging business. You have chosen a perfect niche based on your interest, a keyword rich domain name, world’s best hosting service, and a long-term content creation strategy and SEO action plans. All this will get you results only if you present it neatly to your audiences unless there is no ultimate use of this work. The presentation is the face that tells others how important the topic you are going to discuss now? If you ignore this part, you are ignoring the entire thing in your business. The unplanned designed blog will harm your website in many ways. … Poor website design can affect your website conversions. … Difficult navigation will annoy your visitors and make them leave very sooner. Resulting in increased bounce rate. … User experience is the most important thing that all search engines do care for. Proper SEO optimized layout will help to perform well in your SE rankings. … The design of the website should be responsive to different screen sizes because smartphone and tablet industry has grown tremendously. Designing a blog is an art and you should perform better in this last section so as you can become a successful blogger in the future. There are free themes available but I recommend you go with the paid theme because you can have ultimate features to increase revenue from your blog. Normally a paid them would cost you around $60 one time payment for the lifetime license. There are two different categories of themes available and you should be planned before choosing. … By selling affiliate products or services. 1.) Before choosing the blogging theme, you should think about your monetization method. 2.) Blog design plays an important role to showcase your work on the blog. Choosing a perfect design will help your audience to get an idea of your discussion or the thing you are going to share on your blog. 3.) Poor design and user experience will be the biggest hurdle in your blogging career, so choose it wisely. So in this last 10minutes, you have come up with some technical ideas to start a better blog at your initial stage. 1. Set a Goal: Ultimate goal would be making money blogging, but you can blog about anything. Anyhow, set a proper goal. 2. Be Passion: You should like what you are doing? Without interest and love, you can do things properly. 3. Be Concise: Travel on a narrow path towards the goal. Express yourself precisely with deep information, brief and comprehensive. 4. Spend time: Without time no work can be done. 5. Choose a perfect domain name: No business will be recognized without a name and so does your blogging also. 6. Purchase a reliable hosting: There should be a space to market your product or service. Be legible in selecting a best hosting server platform. 8. Create the right design: Without neat presentation, no one will show interest to read your article. The design also affects conversion and you should focus on both things user experience and conversion. Alright, I have shared enough technically how to start a successful blogging business and have given you an outline sketch before beginning. What so ever, learning from the own experience will be the best lesson you never forgot in your entire life. Blogging is a beautiful business if you start with love and interest. It is one of the best sources of passive income that made many millionaires around the world. Now the chance knocks at your door, use the right opportunity at this right time. Happy entrepreneurial day and start a successful blog today using my tips. Dear visitors, I am always transparent for discussions and welcome you all to a healthy conversation to make a better future.